3DNes VR - 3D NES In Virtual Reality (Oculus Rift - HTC Vive - WindowMR) community » General Discussion · Replied to 00dani in Open sourcing? 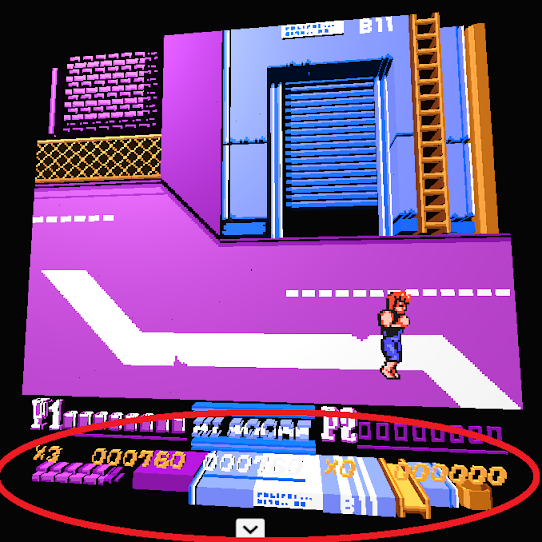 3DNes VR - 3D NES In Virtual Reality (Oculus Rift - HTC Vive - WindowMR) community » General Discussion · Posted in Open sourcing? Geod has an amazing product here. Why should he give out the open source for free and be unable to monetize it when it is finally polished? Especially after he's been spending at least months, if not more, working on this full time for what little compensation people have given to the project. 3DNes VR - 3D NES In Virtual Reality (Oculus Rift - HTC Vive - WindowMR) community » Support · Posted in So, why do Windows users get to have fun? Do you have a debit card from your bank with a Visa or Mastercard logo? You can do a paypal payment with that. Who pays your cable internet bill? Whoever pays that uses a credit or debit card. I'm guessing that your problem with the 2nd Palace is somewhat like the problems that I posted images of in the thread above. I have images for other games in other threads, but I think they're in the 3DN threads, so I didn't dig them up. 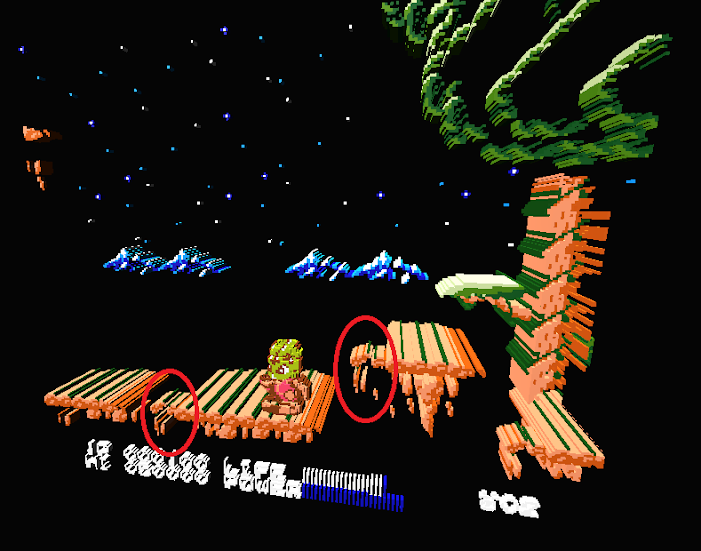 I don't think it's a bug with 3DNes or it can really be blamed on the way Zelda II was programmed. 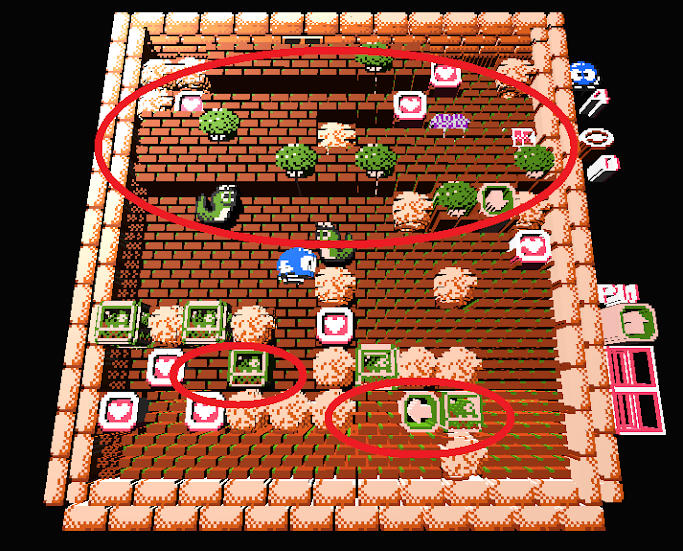 I think that this is just because 3DNes is still growing and these issues are just challenges that geod is working to overcome in future versions. A few of us have already suggested the ability to select a group image and spit it up and manually re-group and re-shape it. We have not heard back from geod if this will be possible yet, but this would eliminate this issue if the user had more control to fine tune these things. I wouldn't play the game again just to get a screenshot until save states are implemented. It wouldn't take a ton of time for you to get back there now that you've done a ton of the 3DN work, but it's not worth it just to make an image IMO. You'd have to do it again when the savestates were included. Just click on the link named "Partial" in the OP and it will download. I'd just like to see save states at this point. Until that happens, nothing else really else matters. I've still got a ton of free time at the moment to work on these games, but haven't even used this for over 2 weeks now because of no save states. 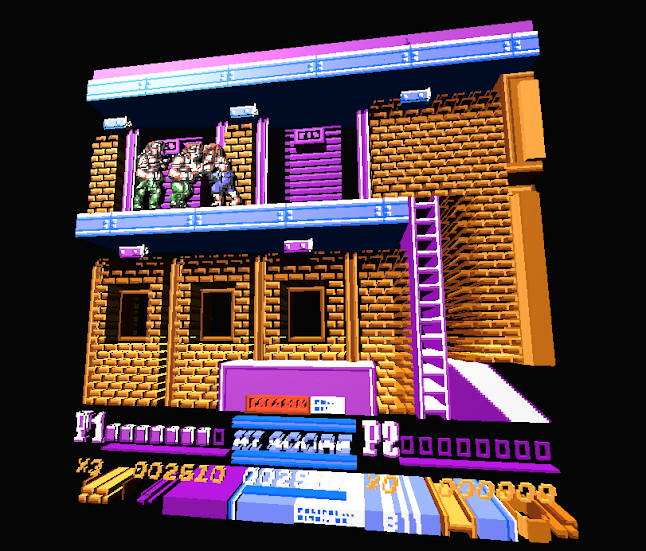 3DNes VR - 3D NES In Virtual Reality (Oculus Rift - HTC Vive - WindowMR) community » General Discussion · Posted in games redone? Oh, I see. I misunderstood your question. I thought the 3DN might have issues because of something that happened with another user and Castlevania before. Which game/3DN, and what was the date of the release of that 3DN in the repository. Wwhat point does it say "Improper Format"? When you try to save the 3DN, or when you try to load the re-saved 3DN? Also, which version release are you using? This is possibly an issue I was worried might happen earlier, but did not want to bring up until it ever became a problem. I suspect you're trying to edit an older 3DN file that was created with an earlier version and it's not playing well with a more recent update of the emulator. Yeah AKJ, Shadowgate doesn't work well. It also has a lot of text problems that will hopefully be easier to fix when you have the ability to select a group of sprites. I think a fragment option would be great to break down images. Even better if there could also be a group button that could then regroup only the ones you wanted grouped. Don't know if this is at all possible, but looking forward to seeing what's next to come. I really don't want to put any more work into these games until the release with save states comes out though. Especially long RPGs like dragon warrior and final fantasy. Just click on Start, then Run. Then type "regedit". (You may have to say yes to making changes to your computer). This will open up something that looks similar to Explorer. For me it wasn't HKCU (Geod may have been abbreviating). One of the 5 main folders on the left side should be "HKEY_CURRENT_USER". 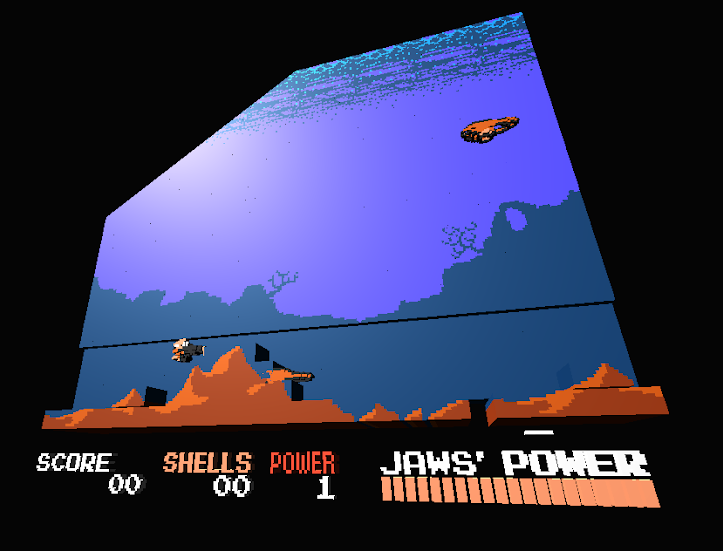 Click on that, then click on "SOFTWARE", then "Geod Studio", and finally "3DNes". You can just delete the "3DNes" folder, or delete all of the files that show up on the right window. (I had 7 of them). That looks great. MM3 was the only MM game I had when I was a kid, so it's by far my favorite. Looking forward to trying it out. I remember loving it when I was a kid. Rented it a weekend or two. Definately a underrated game that I forgot about until you brought it up. I'll have to give it another shot with your file. Any idea about when save states are making their way into the emulator geod? 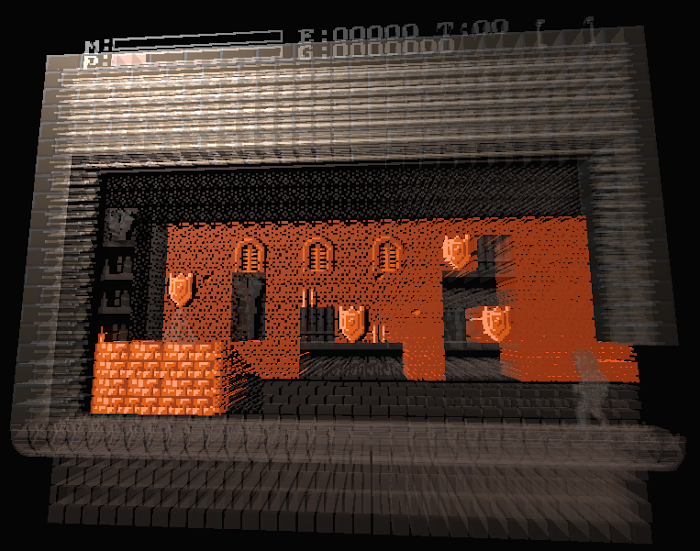 You might want to try the newest Castlevania 3DN file in the repository. Assuming that it's the exact same game except for the title screen I'd be willing to bet that most of the work would show up on Akumajo Dracula as well. Obviously it would be different than your file was, but you could run through and tweak things and re-release it if you wanted to. Obviously you'd have to re-do the title screen and any levels that weren't completed too, but you wouldn't have to start from scratch if it works. I used 1.1b3 to test out Duke Serkol's 3DN. Yeah. Until you've been using it about 25 hours and really start getting the trick to it, it's hard selecting very visible pieces. I've put at least 25 hours into working on the emulator so far and i still find myself clicking 15 times to select a specific piece if it's smaller and surrounded by larger pieces. I can't even really explain why I'm much better at that now. 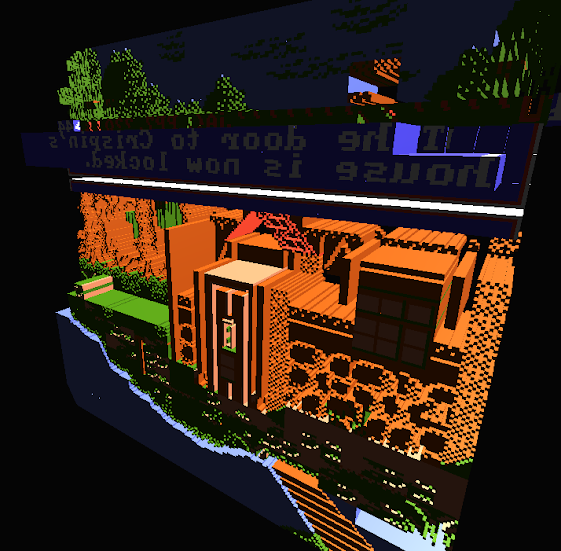 You just get a feel for exactly where the emulator wants you to click to highlight a specific piece based off of what angle you're looking at it from. It's definately much easier to use Cherkov's navigation method. I wish I had some better news for you, but that's an 8MB file I can't figure out. I ran this game both with your 3DN first and then once again with no 3DN file and both times it was exactly the same as if nothing had been saved to it. Now that it's up, geod might have an idea about what's happening here. I've worked quite a bit on about 10 games so far and nothing like this has ever happened to me yet. I'd really love to know how this happened and work under a reasonable assumption that it won't happen again. The first time you save a 3DN file, it creates a ".3DN" file. The second time you send a 3DN, it creates a new ".3DN" file and the old ".3DN" is saved as ".BAK". This is a nice backup feature, but it only serves as a safety feature for one save. I don't believe this was covered at all in the manual yet, so don't feel dumb that you didn't know about it. I wrote a whole suggestion post to create a more complex backup system than this, not even realizing that the emu's creator already had this basic version already in it. If you weren't aware of the .BAK file, I'm wiling to bet that at one point it was about 8MB itself, but if you've saved the 3DN twice with no work done on it since then, it's probably only around 400kb again. if you still have your own saved backup file, try uploading it and posting a link here and I'll try using it myself. I'm not familiar with the game. 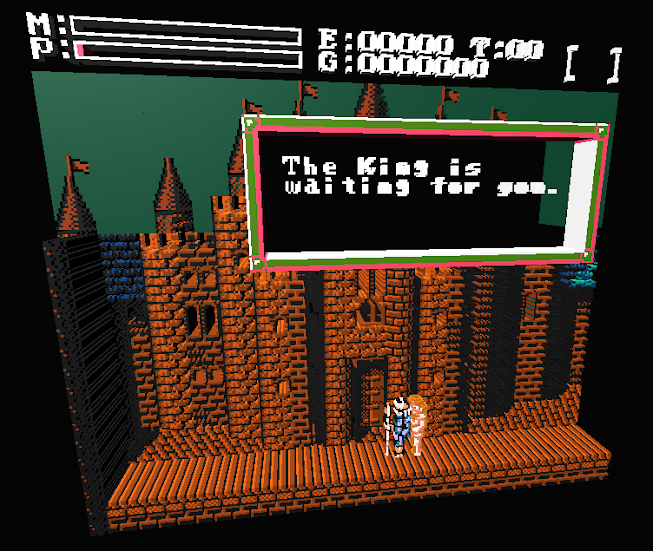 Is this the Famicom version of Castlevania? Right.... there is no install for 3DNes.... nevermind about that. I really don't know why this is happening. You didn't delete the backup 3DN file yet, did you? I know this is a stupid question too, but you're sure the backup file is renamed to the exact name of the rom and the extension was changed from .bak to .3dn, right? Starting up the game while the 3DN was gone wouldn't have caused it. I've recovered bad 3DN files with the backup this way before. If you saved the 3DN while there was no 3DN file and your only .BAK file was there though, it may have saved a new 3DN file and saved over the good .BAK file. In that case you're out of luck. I know it sounds like a dumb question, but did you try rebooting the PC? I was getting a different error after I uploaded my 3DN files to google drive and tried to re-open them again. It would say that there was a sharing violation on the file. Shutting down 3DNes and exiting Google Drive didn't work. The only way I was able to get it to work again was to reboot my laptop. I would really have a hard time believing that you wasted hours of work as long as your backup 3DN remains unchanged. If rebooting doesn't work, I would uninstall and re-install the emulator and see if that worked. Really looking forward to this. 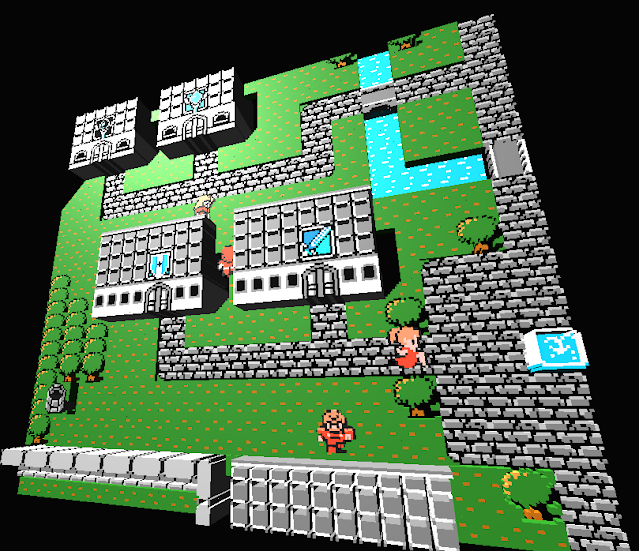 I think I'll work on Final Fantasy or one of the Dragon Warrior games first when we've got save states. This is really impressive Sephalos. 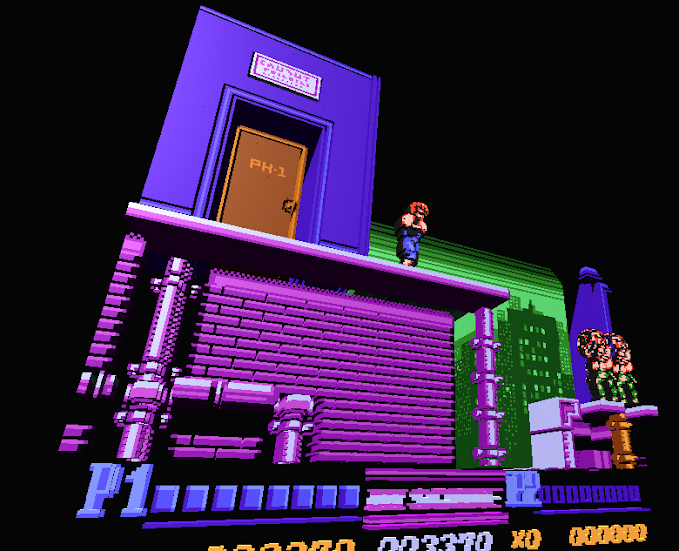 I can't believe that the 3DN file is only 3.14MB with how good it looks. I was thinking about doing this one next until I saw how much you've already done on it. Did this game play nice since most of the sprites are squares? Most of the games I've been working on end up with 3DN files closer to 10MB and I have tons of problems with background and foreground sprites connected to each other. Are you still having problems with the 3DN file after the last update? 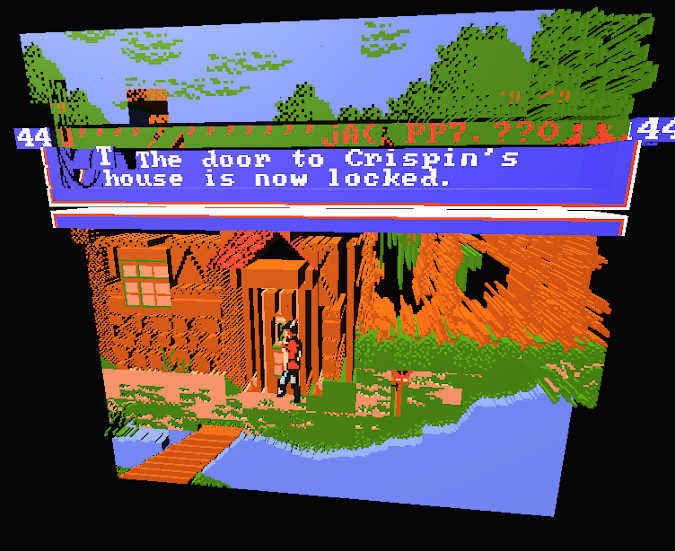 UPDATE: King's Quest V. This bug is REALLY strange. Probably not related at all to the Shadowgate bug, but I didn't want to create another topic that sounded so similar to this. Dialogue is a HUGE part of this game. Every time a dialogue box pops up, it seems to blend with the sprites already on the screen and show a bunch of buggy text and incorrect colors. Also, when you open up your inventory menu the same thing happens. I only took a shot of one example, but this happens every time. This second pic is the reverse side of the game just to show that the text isn't hidden behind the sprites. Big request geod.... Could you make a screenshot capture in the emulator? Uploading a picture here is like an 8 step process. I have to prt scrn, then paste in paint, then edit the image to get rid of the outside garbage, then i upload it to google plus, navigate two screens to copy the image location and then finally post it here. It honestly takes aboiut 5 minutes just to get an image here. 3DNes VR - 3D NES In Virtual Reality (Oculus Rift - HTC Vive - WindowMR) community » General Discussion · Created a new topic Somebody Want to Make Some Videos? I'm working on an ancient laptop that I can't even play the games to work on them unless I cut the resolution in half and set the graphics to "Low". There is no way I can make videos of games I've worked on for the Repository. I was wondering if anyone would be interested making some videos for the 3DN files people post in the repository. Not only would this better show off the work that has been done here, but it should bring some more attention to this project. Yeah. That's why it works about half of the time. In the cases above, it simply won't work. 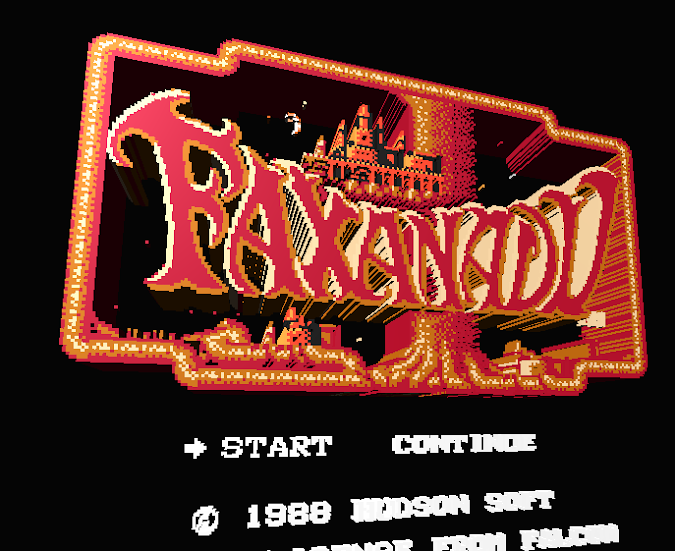 In Battle of Olympus and Faxanadu, it happens in one screen rooms. 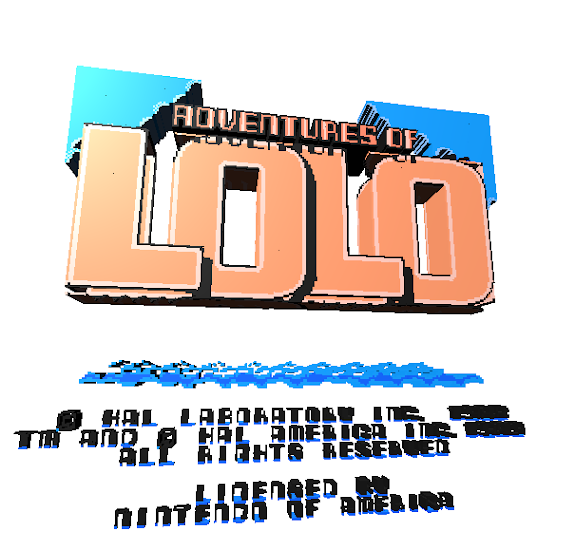 In Adventures of Lolo, you only have 1 screen per level. In Godzilla, the top and bottom 3rds of the mountains are in the foreground, but the background is an entire strip and contains the middle of the foreground mountains. 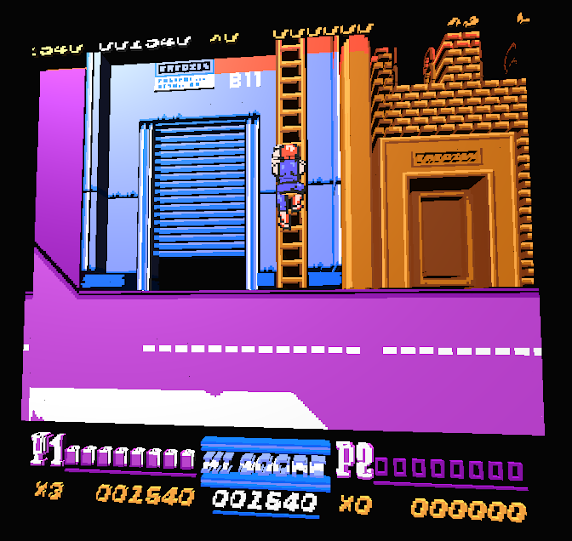 In the stage select screens in the 2nd photo, it is only a single screen. Your explanation makes sense as to how I was able to get it to work in a lot of instances, but until there is a feature made that allows some sort of manual splitting of pre-determined sprites, there are going to be a lot of games that just won't work. Pretty much zero issues doing this game, except my controller is crappy and I can't beat it. I got it completed up until the point you power up your attack the first time. This is probably about 95% of the graphics in the game. I was able to get to the 2nd or 3rd stage on the 5th level before I hit a wall with the Delete function. It was actually working really well for this game until that stage for some reason. UPDATE: I re-uploaded a new 3DN. 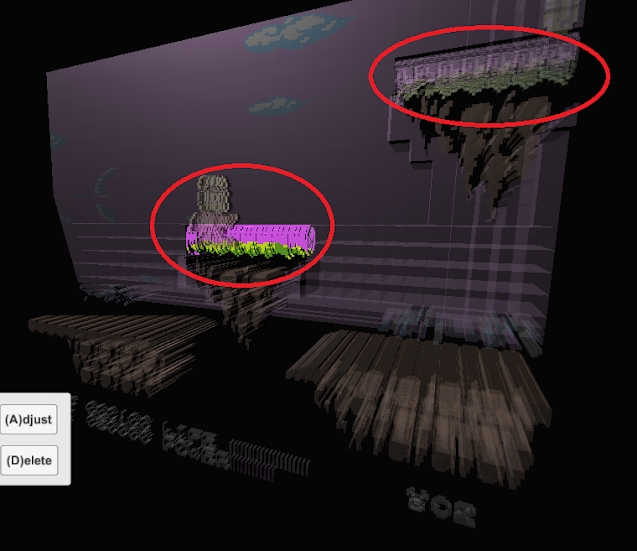 After the problems I ran into later in the game it seems that some of the basic stuff I had done early on were un-done. The new 3DN shouldn't have any problems until the 5th floor now. This 3DN file is up to the 3rd town. This game reuses a lot of sprites and sometimes they're just a different color and this ends up causing a lot of issues. 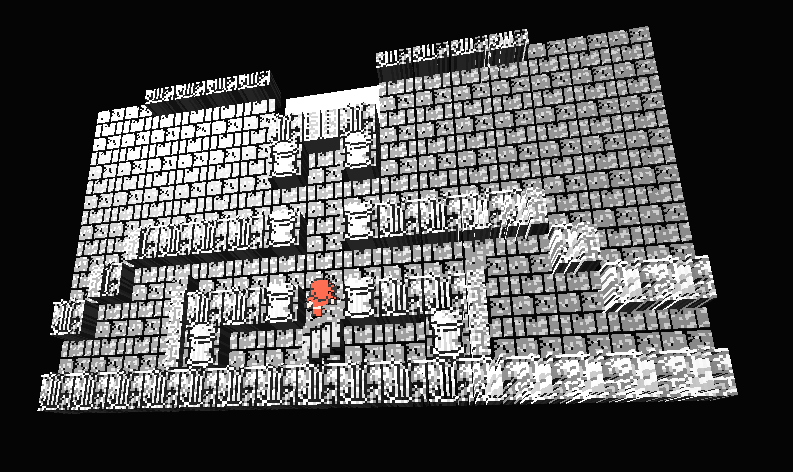 I did my best to give them values that look good and don't interfere with the player or enemy sprites. In the 3rd Town, we run into the problem where sprites completely disappear like they did in Blaster Master and Final Fantasy. This is another game that I'll wait for save states and bug fixes to work on more. In the above image, you can see the wall, the windows and the shields are connected to the desk. Also, for some reason, on the left edge of the desk you can see a bottle that's attached to it as well. The Delete button does not separate any of this. UPDATE 2: Adventures of Lolo. The bricks and trees won't separate at the top. 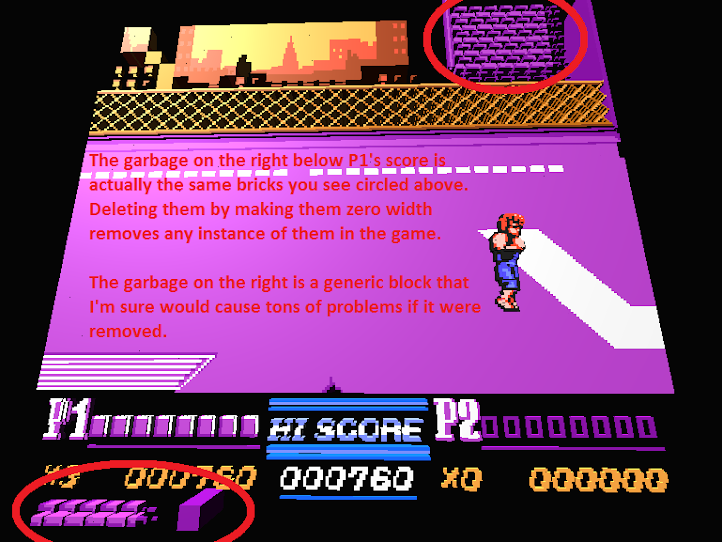 The bricks won't separate from playable blocks on the bottom. The mountains that are supposed to be obstacles in the foreground remain part of the background image. Delete doesn't fix this. 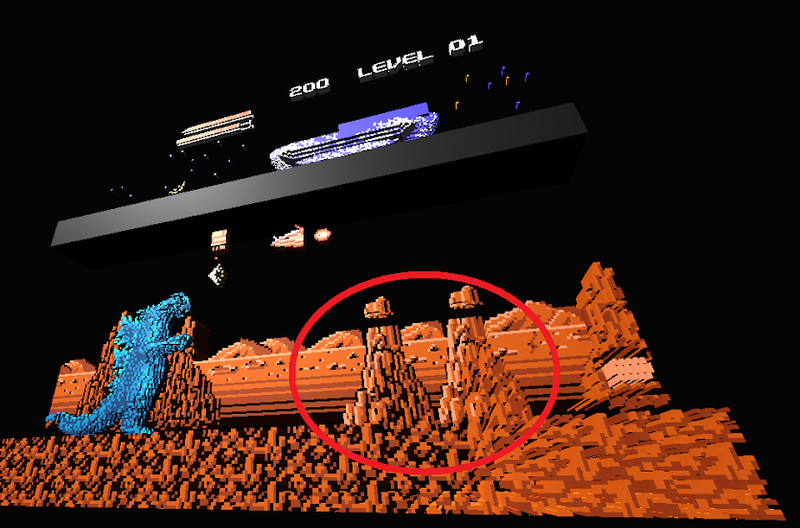 On the map screen, Godzilla and Mothra, and the enemy monsters are part of the honeycomb grid and cannot be separated. Update to Final Fantasy. 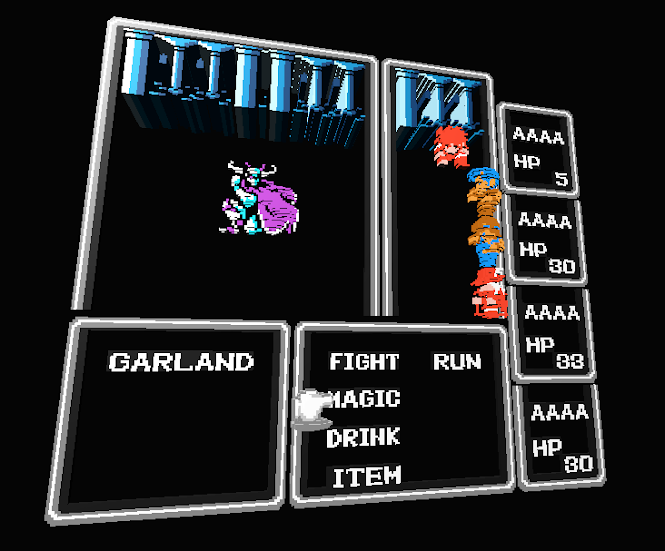 Pretty much everything is complete up until the fight with Garland. 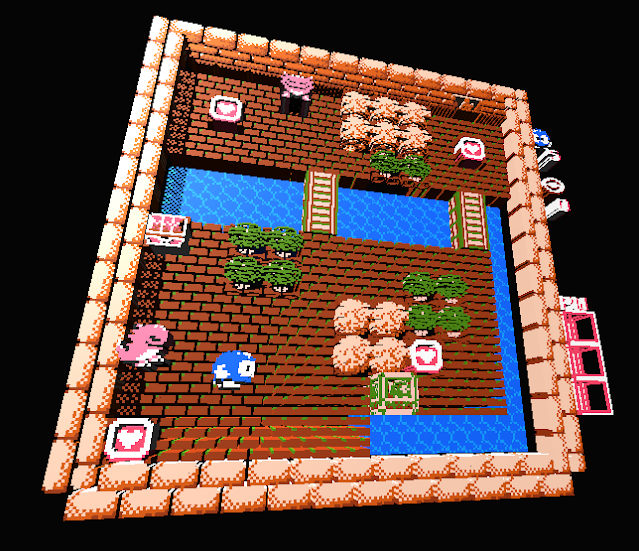 Inside Garland's castle, the game drops floor and wall sprites like Blaster Master did. I will do more work on this once we get savestates and mass selection. There is a ton of text to alter in this game. 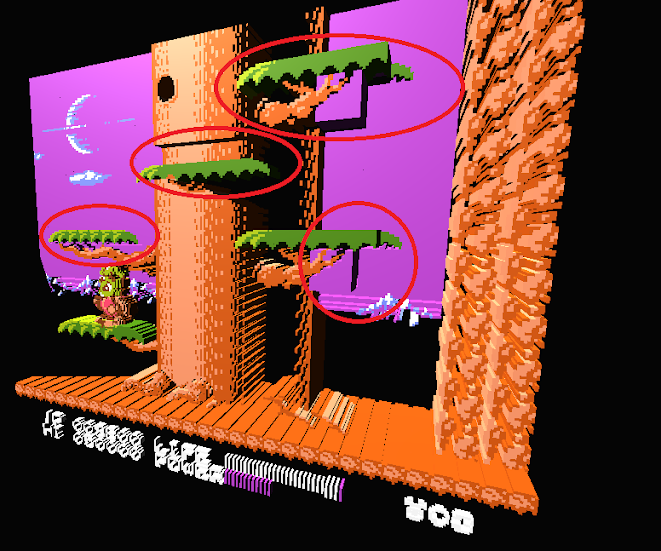 3DNes VR - 3D NES In Virtual Reality (Oculus Rift - HTC Vive - WindowMR) community » Support · Posted in Masking Sprites in Certain Instances, Possible? That's what I figured geod. Don't beat yourself up too much about it though. DD2 is the only game I've worked on so far that is this insane about it. Even DD1 isn't really that bad although both games really need to be gone through "frame by frame" a few times to fix other weird issues. Maybe one day you can fix it? Maybe not. Hey JJXB. Great file you made there. I built upon it for the file I'm posting here. I don't remember what level the Jungle Level is, but it's level 5 or 6. I got most of the way through that one before dying. 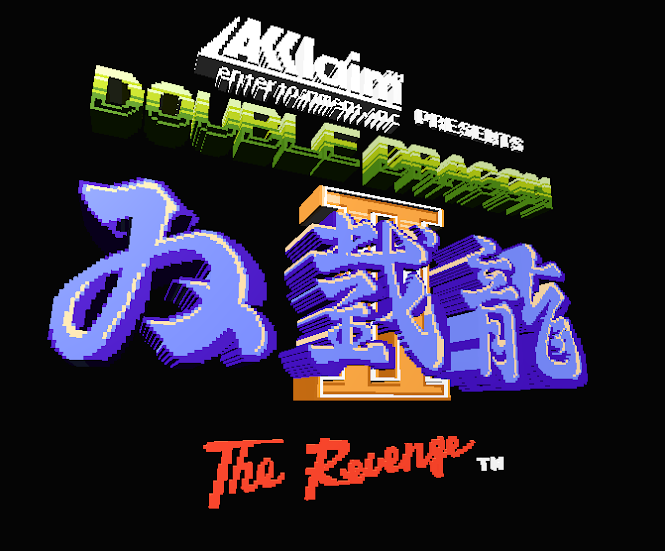 I cleaned up some of the glitchiness in the first 3 levels, and I tweaked the title screen and the cutscenes so they look good too. I won't be working on this one anymore until we get savestates. I just died on the 4th level trying to get back there again. Don't have the patience to keep playing it over and over just to work on it. This is a new one for me. It's happened twice now, so I know it's repeatable. 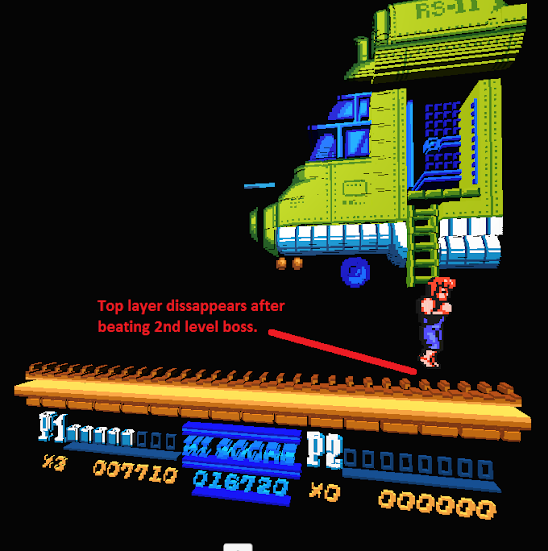 After the 2nd level boss, the layer that your guy is standing on disappears when the helicopter is taking off. Not a huge deal really since the level is over, but it just looks weird and I'm wondering why it happens. Here's a pic. If you're having problems it shouldn't be your computer. I've got a 2.2ghz, HP but it's only an AMD Athlon II Dual-Core. The laptop is a hand-me-down so it's at least a few years old. It's only got 4GB ddr3 ram on it. You've got a quad-core and at least double the ram I'm working with, so it should at least be even. You probably won't be able to play with high graphics on, but you should be able to play with the low settings. 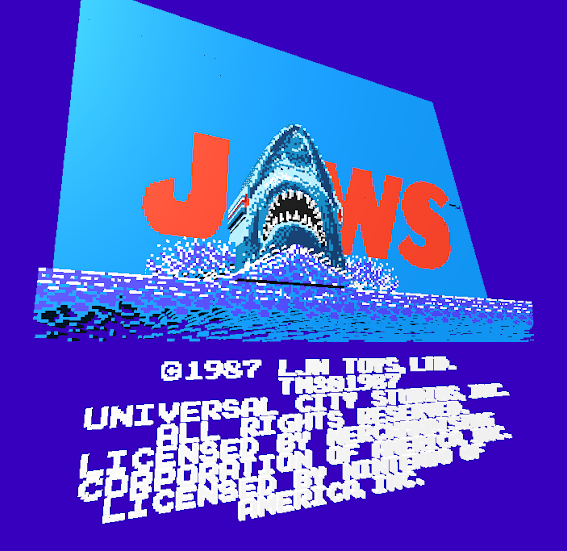 I'm not surprised it takes so much processing power to run this emulator. I'm editing games that are less than 100k, and they end up with a 3DN file that's over 10MB.... over 100 times the size of the original cart. Most people probably aren't working with anything under 1ghz processors these days. I haven't had a computer with under 1ghz for over 10 years now, and I never buy high end stuff. I would be curious to know what the base recommended specs are for this emulator one day, but it would probably take some trial and error working with people having problems with it to find out what the bare limits are. That's awesome to know. Thanks! I've done it 3 times and just thought they were gone forever and you had to start over. 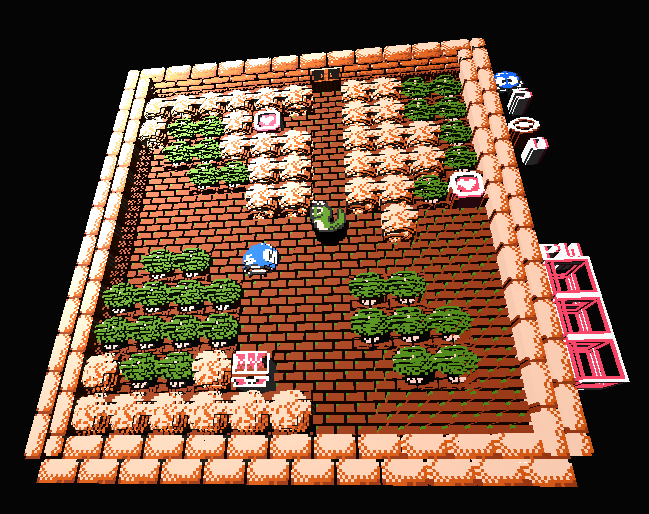 3DNes VR - 3D NES In Virtual Reality (Oculus Rift - HTC Vive - WindowMR) community » Support · Created a new topic Masking Sprites in Certain Instances, Possible? I checked this out on a regular emulator, and sure enough it shows up there too, so this is a problem with the original game. 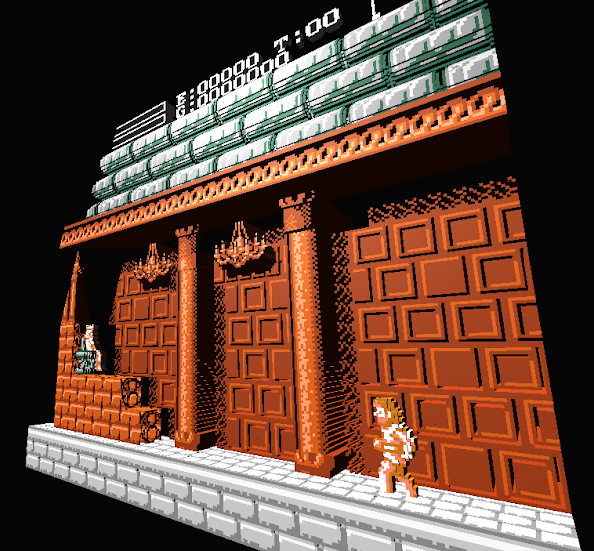 Would it be possible to mask this in your emulator without removing the sprites when they are supposed to be used? I figure it's probably not possible, but thought I should ask. As you can see from the picture below, this can be hugely distracting from the information at the bottom of the screen when it gets out of hand. 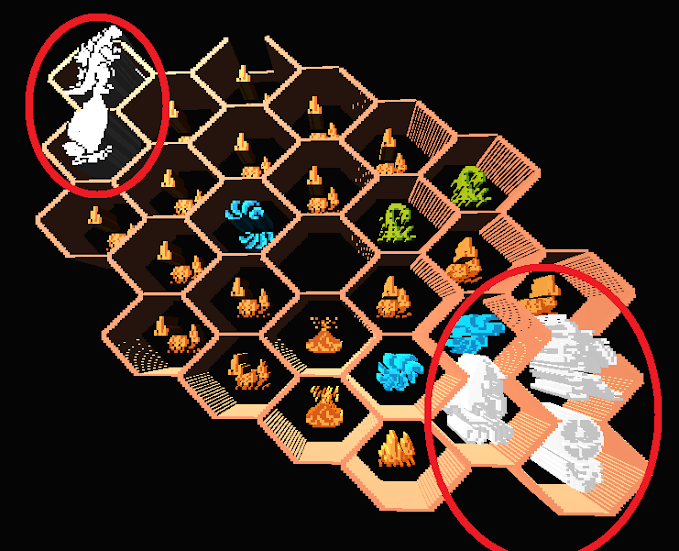 I never really paid it much notice on the original game when the sprites aren't being expanded, but now that they're 3D you can't read anything when this happens. Wow! Look how the numbers from the bottom of the screen show up at the top while going up the ladder! I wasn't able to verify this happens without the emulator, but there definitely is a constant mess of garbage without the emulator on the top and sides as you're moving around. We'll probably just have to live with it, but it's a shame that these minor annoyances are so prominent once you 3D the game.